​We want to recognize the efforts and accomplishments of our families and their Snitker Goldens while also providing information and encouragement in how you and your Snitker Golden can begin this meaningful work of giving back to others. We hope you enjoy a closer look at the incredible things happening in Snitker Golden Families and their communities. *We are not an official club or registration database. Being a part of the Snitker Goldens Therapy Club does not conflict with therapy dog registrations or rules. 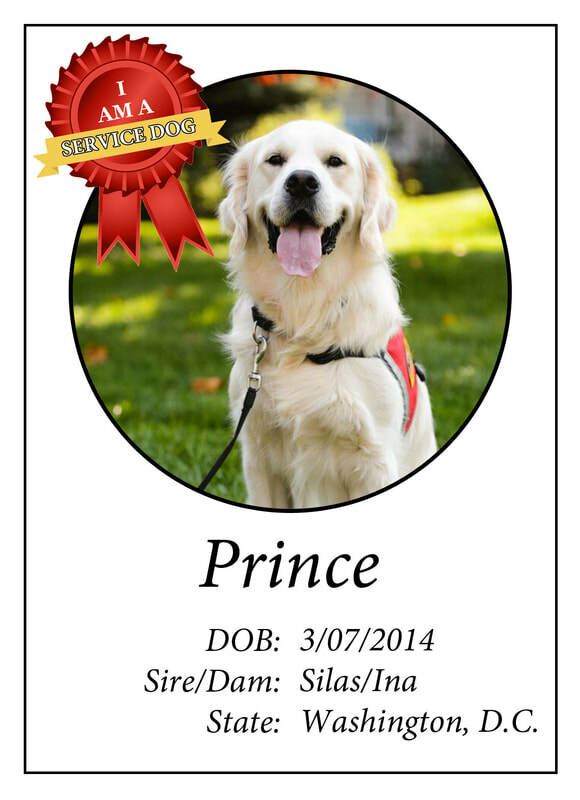 Prince - Service Dog with Veterans Moving Forward, Inc.
​recognizing Snitker Goldens who are working for their humans and their communities; inspiring others to action with personal stories; and providing information and networking opportunities for our clients and others. "It's always been my passion to foster meaningful and trusting relationships with my puppies and adult dogs. And during recent years of graduate study in therapy and counseling, my passion ignited for sharing those relationships in a meaningful way to encourage others. Whether this be working with puppies and the intensive imprinting process, or with adult dogs training for therapy, I hope my work will inspire others to voluntarily serve their communities through pet therapy. I hope you'll consider becoming part of the Therapy Club, and join other Snitker Goldens owners who are already working in this capacity, giving freely to those who would benefit with some encouragement in their day." Rhonda and her boy, Goose, received his Canine Good Citizenship title and are working togther on his path to becoming certified for therapy work. Navigating the world of working dogs can be overwhelming. We hope the resources we've provided will aid, encourage, and motivate you - we are on this journey as well! As we continue to grow as a group, we will add more resources and more real-life stories from our families. For more detailed information, please see our Resources tab. Each dog has his or her own specific task or job that they have been trained to do. Below is a very helpful infographic that was shared with us from our friends at Veterans Moving Forward. Thanks, Michele! This is a great way to see the differences at a glance. To join the Therapy Club, you must first own a Snitker Golden who is working in one or more of the three categories: service work, emotional support work, and/or therapy work. (For more information, please click on the Getting Started tab to see a visual infographic and the Resources tab for requirements and definitions). Fill out your Therapy Club Application. 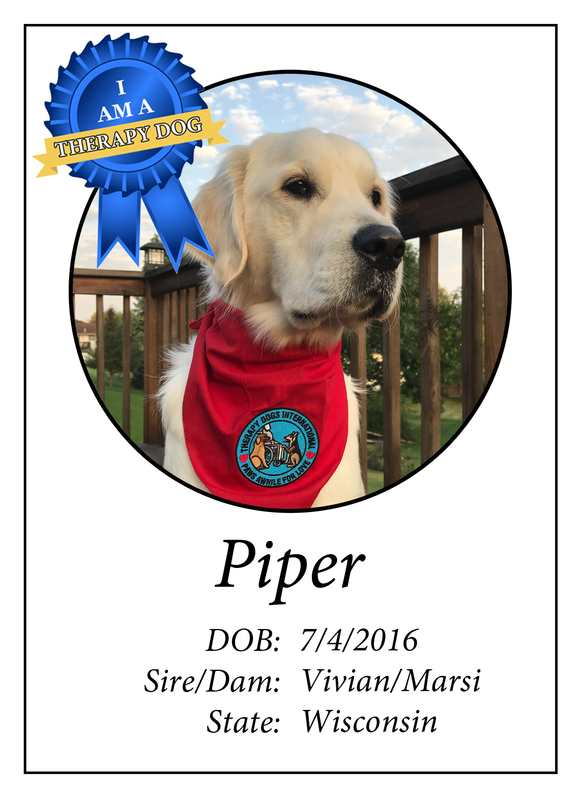 Your Snitker Golden’s photograph, name, sire/dam, DOB, and state of residence will be used. To protect your privacy, requests for contact information will first go through the Therapy Club moderator for permission from dog owner. In this way, all parties agree to the release of contact information. Pictured left is an example of what each Member's profile will look like. A short biography will be included about each working Snitker Golden. Therapy Club Members will receive a Certificate of Membership and a neck-kerchief for their Snitker Golden as part of their membership. Each kerchief's color will correspond with their area of work (service/red, emotional support/green, or therapy/blue). There are no fees involved with the Therapy Club. This is a voluntary club membership for the benefit of our members and their communities. This club membership does not take the place of any specialized training, certification, or otherwise, and shall not be used as a substitute. There are no fees and membership is voluntary. All members agree to the Membership Conduct and Legal Conditions of membership. 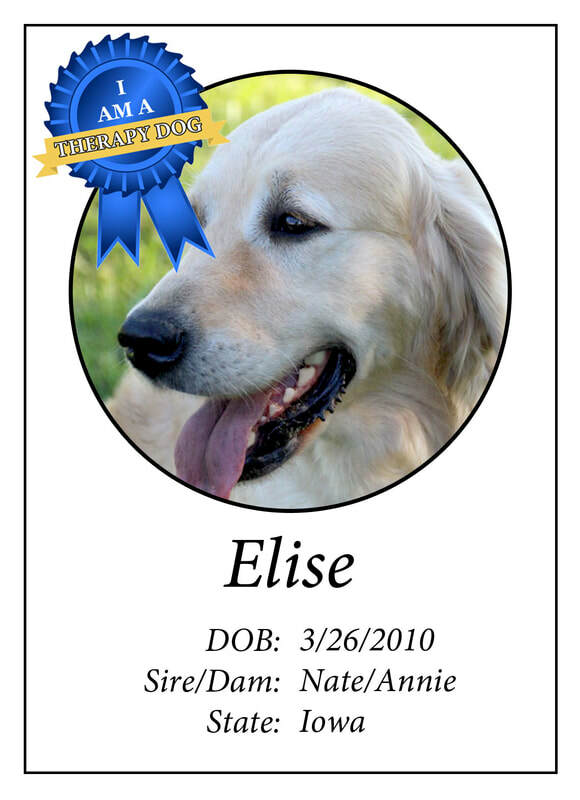 Elise is an eight year old retired Snitker Golden who already had obedience training. We adopted her when she was six years old, she is a very sweet, calm and beautiful Golden girl who is very suited to her therapy work, since she loves to be petted. She does pet therapy at Genesis and Trinity hospitals and is the therapy dog at the North Scott library in Eldridge. The kids love her and look forward to reading to her. She loves her stuffed animal “babies” and treats them like they are her puppies. She had her testing done by CM Dog Academy of Training. She was certified for therapy through The Bright & Beautiful Therapy Dogs, Inc. organization. 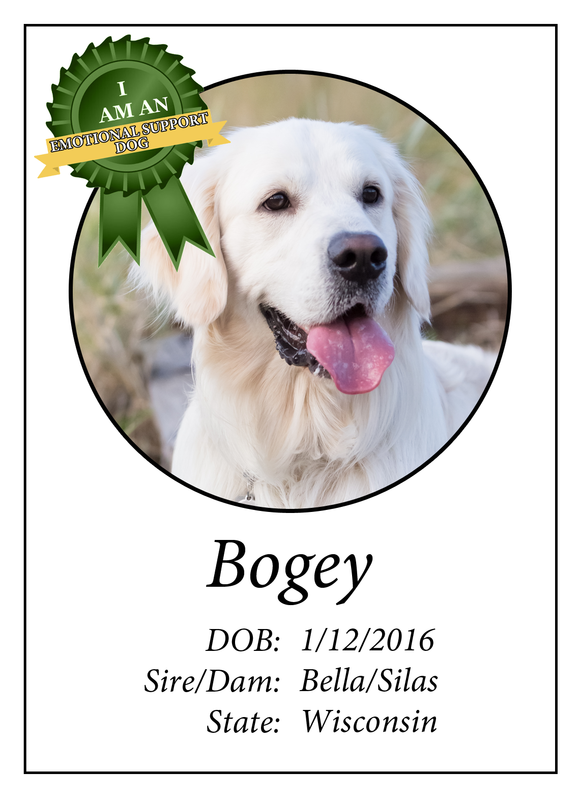 Bogey has completed Level 1 and 2 with Fetch Masters, all the effort is preparing Bogey for taking his CGC. Travel schedules and personal challenges have delayed the actual testing, but I'm hoping to get that completed shortly. After gaining a new Snitker Goldens sister, Piper will be showing the newest member of her family the ropes before going into formal therapy work. She obtained her Canine Good Citizenship as well as her Therapy Dogs International certification. Opi has begun his "career" in church. Starting very young, he began by sitting in the back of the church and has worked his way up to the front of church. He is now capable of any placement. We have intentionally moved perhaps slower than necessary because we felt it's much easier to to be accomplished with one task at a time than have to have to backtrack. This has worked well for Opie. Though the congregation members young and old are familiar to us, they are all strangers to Opie. 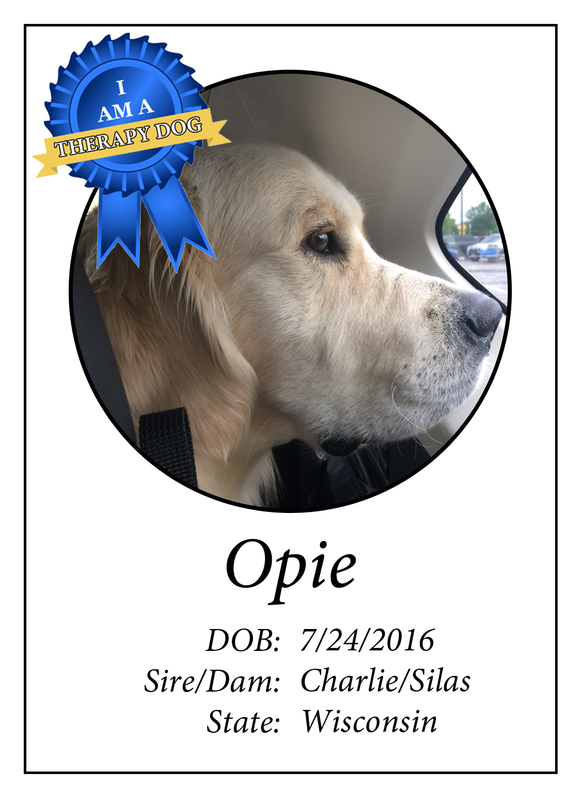 This has been a wonderful opportunity to socialize Opie among people. Having continued with the Snitker imprint process, Opie can confidently be petted anywhere on his large body. I foresee the preschool director creating a Pet Care unit for the children (ages 3-4). Opie enjoys being brushed; from head to tail! Though TDI (Therapy Dog International) prevents us from giving Opie treats while on assignment, he has a very soft mouth. Children will be able to lift his lip and see all his teeth, peek into his ear and lift is long, long tail. Our gentle giant does not lick nor bark, so the children will be able to "explore" and learn "all about a dog." 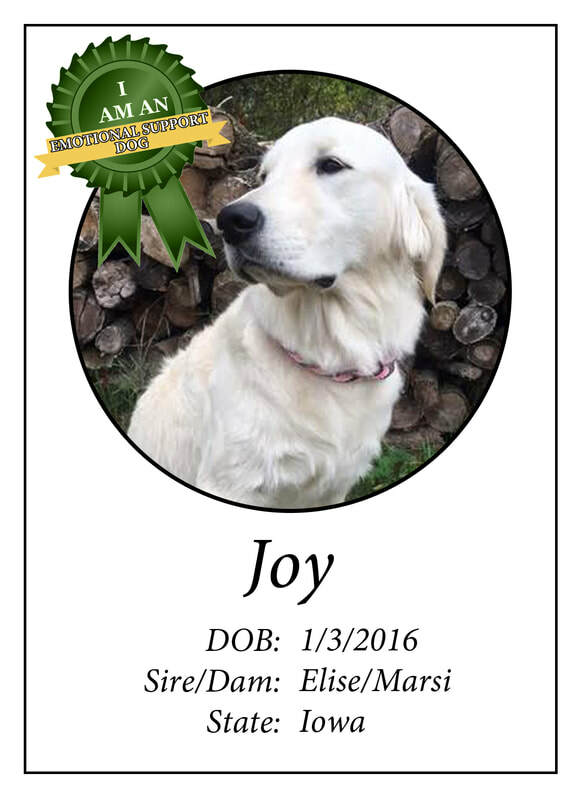 Joy now serving as an Emotional Support Animal in the home and has lived up to her namesake. If her story can be of encouragement, her forever mom would welcome the opportunity to share more of Joy's story. Prince began his two year journey towards service work with his volunteer "raiser" family. Puppy Raiser Mom, Donna, devoted these years to providing him with the tools and training he needed to serve his veteran as well as the staff at Veterans Moving Forward. In 2016, Prince earned his service vest and was placed with his veteran. Prince's servicewoman is an Army veteran who suffered multiple traumatic brain injuries (TBIs). Prince's job requires him to do many things which include bracing (for falls) and retrieving emergency medication. Together, as a team, Prince and his veteran have performed a comedy act in the White House (2016) and proved to other veterans that TBI is not a life sentence. This duo continues to thrive together and more can be seen of Prince and his veteran on our homepage, with a beautiful video entitled, "A Service Dog and His Veteran". Beatrice loves people and truly has the ability to make them smile. I'm especially moved during our visits to the pediatric wing of the hospital. Very sick and sometimes terminally ill children are able to laugh and smile in spite of their circumstances through the simple act of hugging and/or petting Beatrice. Beatrice's tender and gentle demeanor makes her very approachable, even to small children at eye level. ​I adopted Beatrice as a young adult at age 14 months and oh my what a wonderful journey it's been for both of us. We've spent countless hours over the last 16 months training in obedience and agility work. 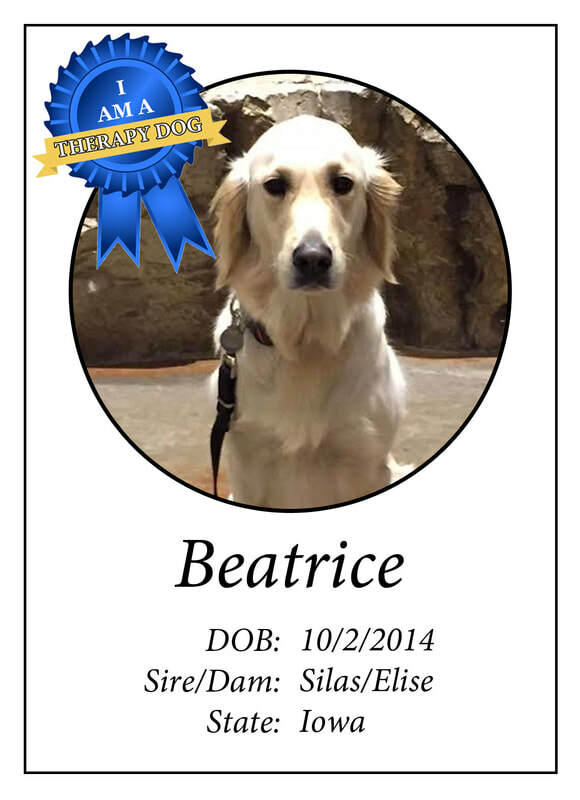 Beatrice earned two AKC Obedience Titles in 2016 and two AKC Agility Titles in 2017. She loves agility training/competition and is quite good at it. Beatrice goes almost everywhere with me. We enjoy long walks and hikes along with frequent trips to the dog park. In addition to being very affectionate Beatrice is also very playful, but yet extraordinarily quiet and calm. Bekah began socializing with other dogs and people from the time she came home with me - we went for walks, met my friends' dogs, and at 8-months old she began visiting the Adult Foster Care homes I worked in (with management approval) due to her great nature, good manners, and the way she brought the residents joy. Over the years, she has often joined me in my office at work, volunteered as a hospice patient visitor, is a 'regular' at a local Senior Independent and Assisted Living Center, and usually joins me for a visit with friends or family. Most recently, she has been my 'assistant' in my new venture of dog-sitting (i.e. dog care while the human family is away); I believe her presence with our dog-clients has not only included companionship, but has also helped to quell separation anxiety and guide leash-walking for some dogs who haven't yet mastered that adventure. While the infographic located on our Getting Started tab is an excellent visual of working dog roles, we want to provide more for those seeking a greater understanding. Provided below is an article with descriptions, requirements, services and legal rights, as well as training information for each of the three working roles. *This article is by no means comprehensive nor is it to be used in place of legal counsel.